“This is day 70 of the brutal military siege in Kashmir. The number of fatalities differs from one source to the next but estimates are between 84 & 90 as of today. Up to 11,000 have been injured, nearly 500 of them by live ammunition, many with head & spinal cord injuries from bullets, pellets, & grenades, many are disfigured & disabled by pellet guns. Over 800 have been treated for eye injuries leaving many disfigured & partially or totally blind. Kashmir is still under curfew & with restrictions on assembly which Kashmiris continue to defy with large funeral cortege/protests & daily street demonstrations. India is now deploying helicopters & drones (supplied by Israel) for aerial surveillance & is also beefing up their ground forces. 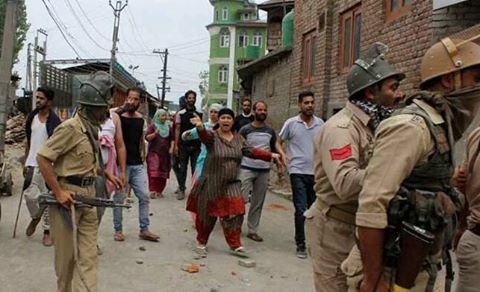 You can see how cowed Kashmiris are by the Indian arsenal from this photo of an unarmed Kashmiri woman taunting soldiers. India has one of the largest military forces in the world. The number of its active military personnel is only superseded by the US & China. It’s even larger than the Russian military. Half a million soldiers are deployed in Kashmir with a ratio of one soldier to seven Kashmiris. How many more ground troops can they deploy, especially when they’re busy beating on their own population? India, which is a member of the UN Human Rights Council meeting in Geneva, blocked Kashmiri human rights activist Khurram Parvez, from boarding a plane in Delhi to attend that Council meeting & report on India’s human rights crimes. Instead they made a foolish spectacle of themselves by attacking Pakistan for human rights violations in Balochistan. End the occupation. Self-determination for Kashmir. Despite Indian civil rights activists repeated requests to withdraw armed forces and repeal of AFSPA , the government is committed to butcher people. Now, even international human rights organisations and eminent people across the globe are expressing their solidarity with Kashmiris. Still, the centre and state governments are not considering to leave Kashmir alone. The rulers position is deplorable and cannot be defended on any ground.